Excited for the weekend? Well, you should be! 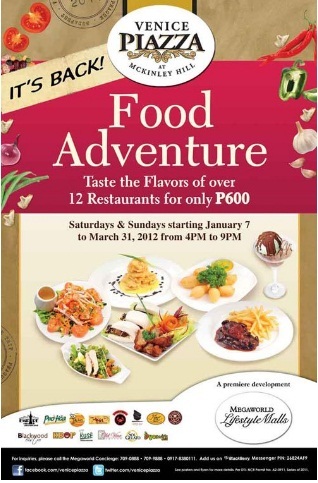 'Coz it's Food Adventure at Venice Piazza every Saturday and Sunday up to March 31, 2012! Taste the flavors of 14 restaurants for ONLY P600! Are you game? 4.For every Food Adventure passport worth Php 600, customers can sample the best sellers of Venice Piazza’s finest restaurants during the abovementioned time (strictly no refund). 5.Passport holders are entitled to pick 1 of the two from a participating restaurant’s dish. For example, choose one between KBOP’s Chapchae or Seafood and Vegetable Pancake dishes. 8.The Food Adventure can only accommodate 300 passport holders every week. 10. This promo is valid for dine-in customers only. Take-out food is strictly prohibited. 17. The Food Adventure passports will be available at the selling booth located at the ground floor of Venice Piazza and the Eastwood Mall Concierge from 11:00AM – 10:00 PM every Friday, Saturday and Sunday.